Odom, 35, was hospitalized Tuesday after being found unconscious at a brothel near Las Vegas. Here's a timeline of key moments in his life. Lamar Odom became a basketball star in 1999 when the Los Angeles Clippers drafted him. He became a reality-TV star 10 years later when he married Khloe Kardashian in a season-opening episode of "Keeping Up with the Kardashians." He continued to appear on the show while he was winning NBA championships with the Los Angeles Lakers. Odom and his wife also starred in their own E! reality show, "Khloe & Lamar," for two seasons. Cameras tracked the couple's relationship troubles through 2014. 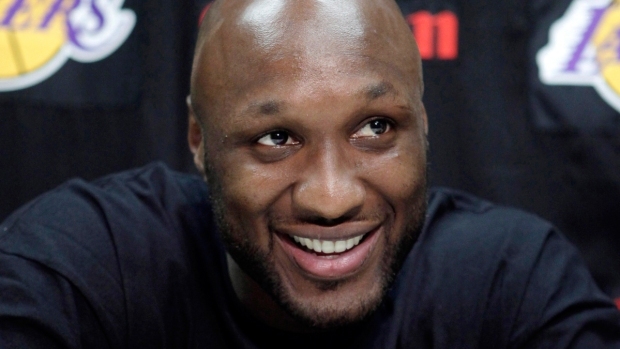 Odom, 35, was hospitalized Tuesday after being found unconscious at a brothel near Las Vegas. The Kardashians discussed his well-being on the show earlier this month.